As part of our wig care guides, here at TCPG we put together a good ol’ fashioned photo step by step guide to help. Why not a video?” We hear you ask. Well it’s because some of our lovely visitors who asked for the guide explained that their connections were not as quick as others and would prefer pictures, so here goes. Remember that whenever you’re using a comb, to always do so gently, don’t pull at the hair as this causes shedding and distortion of the strands of hair. You can apply oil to the hair to help with detangling. 1. Always start by running your fingers from the bottom of the hair (tips). Then repeat moving upwards (towards the cap/base). This teases out any out any knots or tangling. 4. 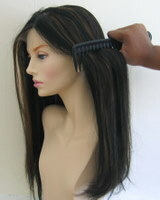 Then comb from the top of the hair near the base cap. 5. Using the spray bottle, fill it with water and a capful of shampoo. 9. Use the comb to distribute the moisture. This is the actual washing of the hair. 10. Use a shower head (or a bottle if you don’t have a shower head) and starting from the bottom of the hair to rinse out the shampoo. 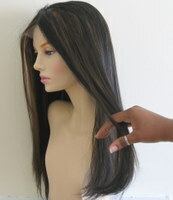 Work your way towards the base of the wig (cap) until the shampoo is completely out of the hair. At this point you can spray a solution of fabric conditioner/wig conditioner and water on your synthetic wig. This helps soften the fibres and get rid of any frizz. 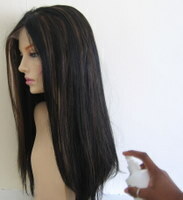 If you have a human hair wig you can spray on your deep conditioner. Whichever conditioner you're using, follow steps 5 – 9 before placing the wig in a plastic bag (those used for food wraps are fine). If you don’t have a heat pack a sink full of warm water is fine (if you can’t put your hand in the water it’s too hot). Then resume from step 10. 11. Once all the shampoo is out of the hair it’s time place the wig on a towel. 12. Blot (pat) the towel (don’t rub as this causes tangling) for a few minutes. 13. 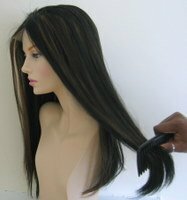 Once most of the moisture is out of the wig (it will still be damp) place the wig back on the Styrofoam head and repeat steps 1 – 4. 14. 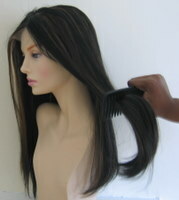 Once you’ve combed the hair through, apply your nourishing oil to the hair, then place the wig back on the stand to air dry. Voila, wig care for washing all done and dusted!